In July 2018, a deeply disturbing and violent video began to circulate on social media. Taking place in Cameroon, it depicts two women and two young children being led at gunpoint away from a village by a group of Cameroonian soldiers. Blindfolded, the victims are forced to the ground and shot 22 times by the soldiers. Robby Deming, Media Strategy Manager for Esri, created a Story Map of the stadiums played in during the 2018 World Cup. Also, DigitalGlobe, who provided the high-resolution satellite imagery for the story map, offered valuable background on the collection of the imagery and how it would serve other industries besides the World Cup itself. Both large full size satellites as well as small satellites are now being used for various purposes around the globe. In addition, constellations of satellites are being developed for specific purposes, such as internet satellites. We also include here maritime surveillance that relies on Satellite Automatic Identification System (AIS) payload. Since 20o4, when Edinburgh-based Pufferfish co-founders Oliver Collier and Will Cavendish had an idea for an innovative digital display that will give a physical presence to digital content, Pufferfish has been gaining in popularity as a digital display medium of extraordinary versatility. PufferSphere is a compact, acrylic globe with on-sphere touch interactivity for the inflatable range. I saw the PufferSphere at the Esri UC in the Start-Up Gallery, and thought then what an innovative and engaging tool it would be for many geospatial uses. While other companies offer spherical display, Pufferfish has continued to increase its expertise in exclusive touch technology with professional signage range, and pushes the envelope for innovation in spherical displays and data visualization. DigitalGlobe, Inc. this week announced an agreement to provide elevation data to Rise Broadband, a fixed wireless internet service provider (WISP), to enable faster and more efficient deployment of wireless internet services in the United States. Wireless networks are becoming denser and base station location is critical to service quality. 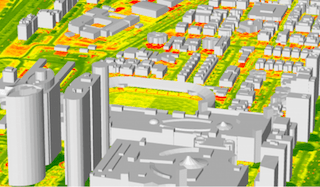 Digital Surface Models provide the accuracy that planners need to optimize urban network performance. photo courtesy DigitalGlobe, Inc. According to a press release, on February 24th, MacDonald, Dettwiler and Associates Ltd. (“MDA”) (TSX: MDA), a Canadian multinational communications and information company providing technology solutions to commercial and government organizations worldwide, and Colorado-based DigitalGlobe, Inc. (“DigitalGlobe”) (NYSE: DGI), a global leader in Earth imagery and geospatial content, announced they have entered into a definitive merger agreement, pursuant to which MDA will acquire DigitalGlobe for US$35.00 per share in a combination of cash and stock. Colorado-based DigitalGlobe, provider of commercial high-resolution Earth observation and advanced geospatial solutions, recently entered into an Integrator License Agreement with CyberCity 3D, Inc., a geospatial 3D modeling and streaming services company headquartered in Los Angeles County, CA. DigitalGlobe owns and operates a highly sophisticated constellation of commercial earth imaging satellites. 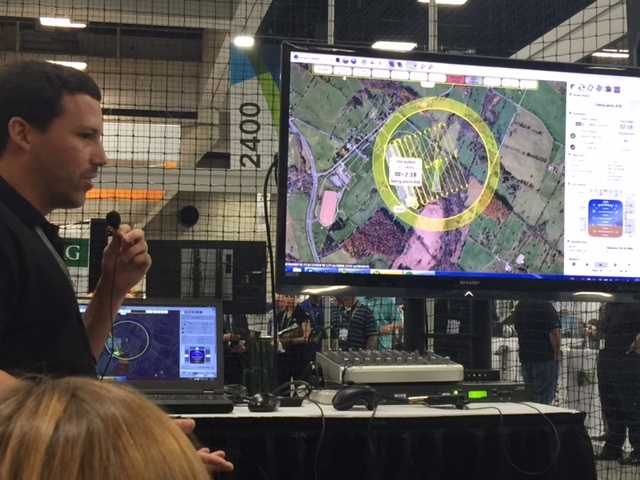 What was the most exciting attraction in the Exhibit Hall at the Esri User Conference 2016? Hard to say, as the 14,000+ attendees flocked to see the plethora of exciting exhibits from third party companies, and of course the numerous demonstrations of Esri products and services. Drones, imagery, field solutions, utilities, navigation, spatially enabled business apps, data management, all vied for an audience at the conference. Esri’s Drone2Map was a huge hit, and Collector for ArcGIS was a product that garnered an enormous amount of attention at its demonstrations and technical workshops, offering the promise of providing mapping to professionals in the field workforce that would in turn, improve the accuracy and currency of spatial data.